Recently, scientists from the Van Andel Research Institute (VARI) in the United States have revealed for the first time the atomic-level structure of a promising drug target for diseases such as stroke and traumatic brain injury. The research results are published in the latest issue of Nature, December 6th. The target protein is TRPM4 (the melatonin-related transient receptor potential), a type of important cation channel family located on the cell membrane. In recent years, it has been found that TRPM4 plays a key role in maintaining certain physiological functions and is closely associated with human disease. TRPM4 is found in all tissues of the body, including the brain, heart, kidney, colon and intestinal tissue, etc, where it plays a major role in regulating blood flow to the body through vasoconstriction, as well as setting the rhythm of the heart and moderating body immune response. TRPM4 is primarily involved in the regulation of blood supply to the brain, which only accounts for about 2% of the body’s total body mass but requires 15% -20% of the blood supply. To block blood flow in the brain for several diseases, such as stroke, traumatic brain injury, cerebral edema and high blood pressure, can have serious consequences on the health of patients. Of course, these diseases are also important public health problems currently facing mankind. The researchers also expressed that the structure of TRPM4 is distinctly different from other molecular structures in the TRP superfamily, which is a special class of proteins that mediate the body’s response to sensations and sensory stimuli, such as pain, pressure, vision, temperature and taste. Known as the ion channels, proteins like the TRP nestle within the cell membrane acting as safeguards to regulate the intensity of the chemical signals that pass in and out of the cell. The TRP superfamily contains eight molecules, and TRPM4 appears to be wholly unique. For the first time, this study mapped the structure of the TRPM4 protein at the atomic level. It is a crown-like structure, with four peaks that make up a large N-terminal domain, which is also a major hallmark of TRPM4 protein. This region, found at the start of the molecule, is a major site of interaction with cellular environment and other molecular. At the other end of the TRPM4 protein, called the C-terminal domain, the researchers found an umbrella-shaped structure supported by a “”pole” and four helical “ribs”, a feature that has never been observed. 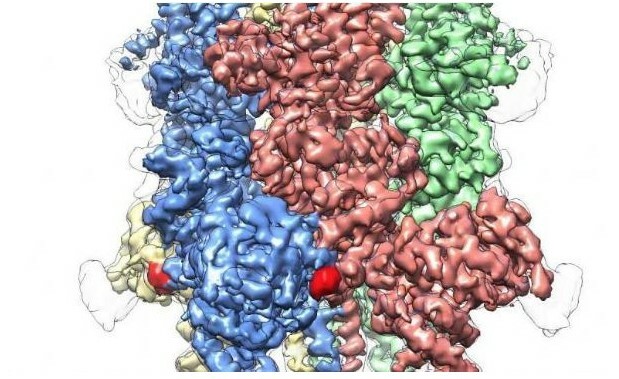 Researchers clearly observed the atomic level structure of TRPM4 protein using an advanced cryogenic electron microscopy suite that enables scientists to observe the details of the smallest components of life. Dr. Lu believes they will do more in-depth studies to elucidate the key role of TRPM4 in the development of a variety of diseases to provide potential targets for the development of novel disease therapies.